The Eagles started the game and used a 9 play drive to set up a 52 yard field goal by Jake Elliott. Facing a third and 4, Nick Foles connected with Torrey Smith on a 15 yard pass down the sideline, putting the Eagles in field goal range. Starting at the 25, the Patriots got their first offensive possession of the game. It starting with 3 Dion Lewis rushes, picking up a first down. Tom Brady was sacked by Brandon Graham, setting up a 2nd and 16. Two plays later on third and 11, Brady found Rob Gronkowski down the middle of the field for a long 63 yard touchdown. Philly would use a healthy mix of runs and passes to get into the Patriots 30, but had to settle for another Jake Elliott field goal. This time from 46 yards out. 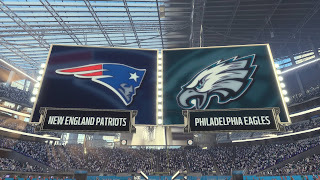 The Eagles would force a Patriots punt to start the second quarter, starting the drive from their 24 after an eight yard punt return b Kenjon Barner. On the drive the Eagles would convert five third downs, including a 3rd and 11 on the Patriots 38 when Foles found Zach Ertz who broke away from a tackle and picked up 18 yards. Then on 3rd and 3 from the 13, Foles threw a corner fade route to Alshon Jeffery in the end zone who came down with both feet in bounds, giving the Eagles the lead once again. Both the Patriots and Eagles would trade punts, before Stephen Gostowski knocked in a 50 yard field goal, cutting the Eagles lead to 3. For a second straight possession the Patriots defense would force an Eagles punt. Trey Flowers brought down Nick Foles for a sack on third down, giving the Patriots a shot to add points on the board with just 1:34 left in the half. To nobodies surprise, Brady was able to set up Gostowski with another long field goal opportunity. Brady connected with Danny Amendola three times on the drive, for gains of 10, 17 and 16. Gostowski nailed the field goal from 56 yards. The Eagles defense forced a Patriots punt to start the second half, and then the Eagles wasted no time getting the lead back for a third time. Foles hit Smith for 21 yards, then LeGarrette Blount had back to back runs of 13 yards, setting up a first and goal from the 3 and Blount would bully his way into the end zone capping off the quick drive. Not to be outdone, Brady used some big plays of his own to get the Patriots in the red zone. He connected with Brandin Cooks for 18 yards, Chris Hogan for 14 and Gronk for 11. After two strong runs by Rex Burkhead, Brady would throw a quick slant to Danny Amendola over the middle for a 2 yard touchdown. Philadelphia would open their drive with six straight runs, before Ertz was able to pick up 22 yards on a play action pass from Foles. Jay Ajayi appeared to have scored a 28 yard touchdown on a toss play, but it was called back for offensive holding. The drive would stall out and Josh Elliott would come on to kick his third field goal of the game, this time a 46 yarder. The two teams would trade punts to start the fourth. New England would finally come through after a James White screen pass went for 37 yards, down to the Eagles 27. Brady would find Brandin Cooks down the middle for a 27 yard touchdown on the very next play, as the Pats retake the lead. After a quick three and out the Eagles would give the ball back to Brady with a chance to make this a two possession game. Brady would be sacked by Fletcher Cox on the Eagles 22. It was returned by Jake Long to the four yard line. Two plays later Blount would find the end zone for a second time, putting the Eagles back on top with only three minutes left. As the Patriots were threatening, Brady threw a pass to Chris Hogan that was tipped and intercepted by Ronald Darby who quickly went out of bounds. With only one timeout remaining and just over a minute to play, the Eagles would run out the clock, giving them their first Super Bowl in team history.